WITH FRIENDS – Karen (left) and Morgan Wienberg are seen recently in Haiti with ‘a couple of our cuties,’ as Karen calls them, just heading out to school from the Boy’s Transitional Safehouse. They now support 247 children for schooling, receiving report cards for each one. ACHIEVING PROGRESS – The core organizing and participating group for the remarkable Prevention for Abuse to Children and Women’s task force is seen with Morgan Wienberg (second from right). Members include the director of Haiti Social Services, the director of the Child Protection Brigade, United Nations Policing, and the local chief judge. 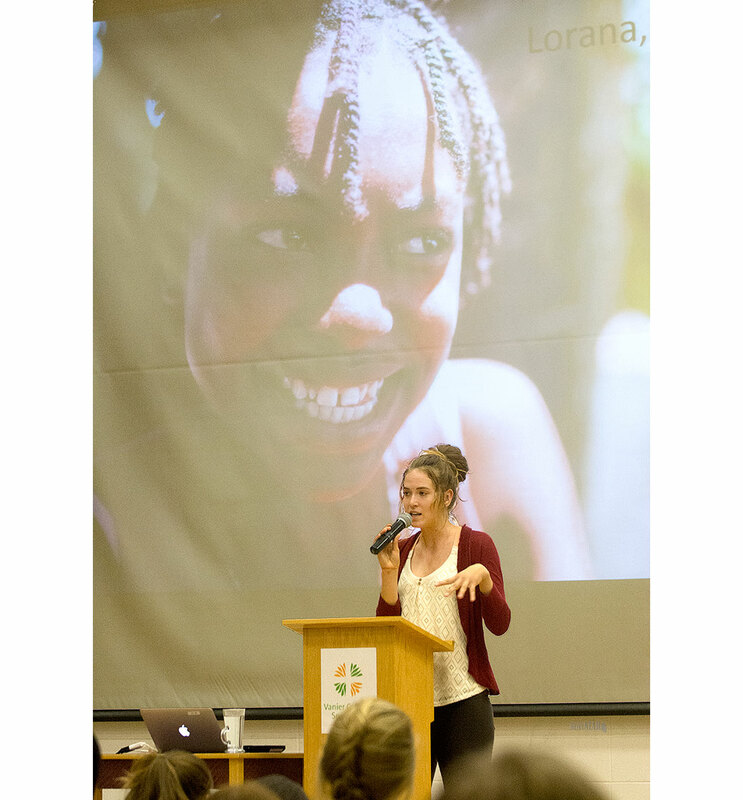 RELATING HER EXPERIENCES – Morgan Wienberg speaks about her orphanage in Haiti on Wednesday afternoon at Vanier Catholic Secondary School in Whitehorse. Morgan Wienberg’s work in Haiti is well-known to many Yukoners, though few have had the opportunity to speak directly with her about it. The 23-year-old is back in her hometown this week for the first time in two years. While it could be a good opportunity to take a well-deserved break, Wienberg is doing just the opposite. Instead, she is spending her time visiting local schools, meeting with the Whitehorse board of Little Footprints Big Steps and updating Yukoners on her efforts in Haiti. All that, and on Wednesday it was announced she’d been awarded the Meritorious Service Decorations by Governor General David Johnston. “I’m pretty, incredibly honoured,” she said in an interview. She described it as being reassuring because she sometimes wonders if her work running safe houses for children and helping families be more sustainable is being taken seriously by the wider community around the world. It’s one in a number of honours Wienberg has received for her work over about the last four years. She has also addressed world leaders through the United Nations and spoken at universities. A documentary crew has also been working on a film about her and Little Footprints for the last two years and is in Whitehorse this week filming her in her hometown. Wienberg has been sharing her experience throughout schools in the city since she arrived back in Whitehorse. Following her presentation at Vanier Catholic Secondary School on Wednesday, she said she especially enjoys sharing her story with high school students. Recalling her own experience in high school, she said it’s easy to “create a box” around your own life without realizing how connected you are with everyone else. “We’re not just citizens of Whitehorse, we’re citizens of the world,” she said. It was a graduation gift from her mother, Karen, that saw her make her way to Haiti in 2010. As Wienberg, who was the 2010 valedictorian at F.H. Collins Secondary School, told students in her presentation after the earthquake in Haiti that year, she knew she wanted to help somehow. She asked for a ticket to Haiti for graduation so she could go there and volunteer after the school year. She was given a return ticket to Haiti and planned to go to university in the fall. Wienberg returned to Whitehorse and soon told her family that those plans had changed. Instead, she would defer her post-secondary education to go back to Haiti and continue helping the children there. “I realized those plans (for university) could wait,” Wienberg said. She had been introduced to an orphanage there with 75 children, who were essentially left looking after one another. Eight- and nine-year-olds cared for babies while 13- and 14-year-olds often stayed home from school to cook for the children. She had witnessed a child who was beaten because she had given him a piece of salami; children who were weak or sick were accused of lying to get out of chores. The latrine emptied into the same river that the children bathed in; and the children had no sense of identity simply being referred to as “boy” or “girl”. If a child disappeared, Wienberg said, nothing would be done about it. 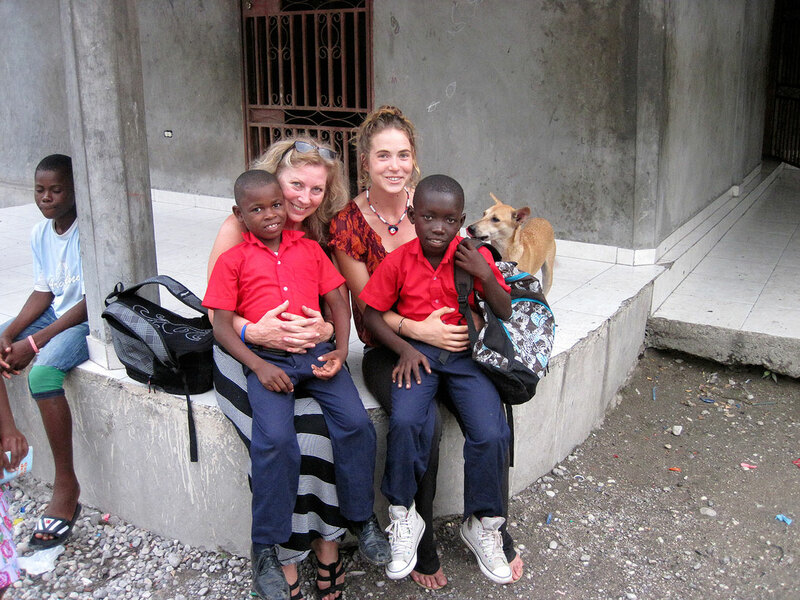 After returning to Whitehorse, Wienberg set to work fundraising so she could return to Haiti and help the children. In February 2011, she was back in Haiti, volunteering at the orphanage where she lived alongside the children for 5 1/2 months; sleeping in a large military tent along with 40 of the youngest children. Rats and cockroaches scurrying along the ground at their feet were a regular thing. When it rained, they would have to all crowd in the middle of the tent to avoid the drops falling on them through the night. Meanwhile, any boys 10 years and older were forced to sleep outside. And if it was learned Wienberg was providing them with socks or a blanket, they would be beaten. Though the orphanage was supported by international aid organizations, any donations that came in were sold by the woman running the facility. “This was a for-profit orphanage,” Wienberg said. As she learned the Creole language spoken, she came to learn the stories of the children and how they had come to live at the orphanage. And she soon learned that many actually had families. What was happening, Wienberg explained, was the woman running the orphanage would travel to the poorest rural regions nearby. She would then tell them she could offer the children opportunities in schooling and aid that they would not have in their own homes. “So they gave up their children,” Wienberg explained, noting the extreme poverty the families were living in and the struggle they had to provide for their children. As she got to know the children, it became clear that more than anything else they wanted to be with their families. In secret, she began finding ways for the children to contact their families. “And the parents started to come and reclaim their kids,” she said. She also began doing whatever she could to contact authorities and have the orphanage shut down. It became Wienberg’s goal to help children reunite with their families and help families become more sustainable. She moved to a community in southern Haiti, where she continues to live today, to begin that work with many of the children who had been at the orphanage having families there. Moving there, she soon realized there were a number of children living and sleeping in the streets. “Most of these kids just have the clothes on their back,” Wienberg said. She started sitting and talking to the kids. Like the children at the orphanage – which was eventually closed after a couple of years of calling on the authorities to shut it down – these children too had families who were struggling with poverty. Wienberg and her supporters, through the Little Footprints group that had formed, focused on opening a safe home for the children. While the ultimate goal of the Wienbergs is to reunite children with their families, it can take time to track their families down, or they may need a safer environment for a time. While that is being done, they stay at the safe house, Wienberg explained. While the trust of most of the street kids grew after she began visiting them each day and they eventually came to stay at the safe house, there was one child who could not trust anyone. As Wienberg recalled, she was continually reminded by others that the 12-year-old was crazy. And when Wienberg would sit and talk to him, he wouldn’t respond, or if he did, he’d make animal noises or laugh. He had been on the streets since he was nine, when his mother died. A large tumour on his cheek meant that he would make more money than others begging in the streets, but it also made him a target of other children who were begging. They would glue his eyes shut, attack him and so on. As a result, he became violent and isolated from anyone one. It wasn’t until Wienberg showed up late to visit him one day that he spoke to her. When she arrived, he was crying and told her he didn’t think she was coming that day. “That’s when I realized it had made a difference for him,” she said. That boy has since come to live at the safe house and will undergo a third and final surgery to remove the tumour from his face. At 15 now, he is attending school and is at a fourth grade level while also working toward an apprenticeship in motorcycle mechanics. Her experience, she said, has taught her not to judge a person’s potential by where they are at that moment and not to underestimate the power everyone has to make a difference. “You can make a difference for someone else,” she said as she was greeted by applause from the high school students. 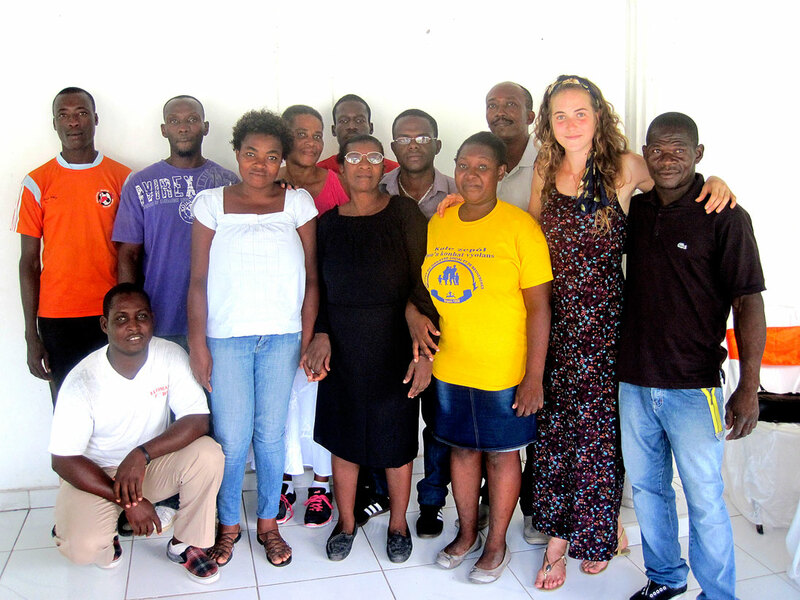 Little Footprints now employs 12 staff in Haiti who work at the safe houses and provide outreach support to help families who have been reunited with their children in helping the family become more sustainable through employment, farming and other programs. Wienberg had high praise for her hometown, noting that Little Footprints has received a lot of help from Whitehorse residents over the years. Wienberg also put her own university savings and money she had from working at Alpine Bakery as a teenager into the organization. While she receives a small salary (of $100 per month) for her efforts now, in the first couple of years of the organization she wasn’t receiving anything, and she credits her mother for providing for her expenses at that time. For Wienberg, home now is Haiti. “I want to live in Haiti for the rest of my life,” she said. After her presentation at Vanier, the school’s social justice club provided a donation to Little Footprints. Janet Clarke, a teacher who helps oversee the club with another teacher on staff, said having Wienberg visit the school enables the students to see what a young individual can do. Thank you for your interest and supportive words. Please go to our website for more information, videos, Blog stories and photos, and the donation options. Certainly I applaud the efforts of this young lady; even going to Haiti takes courage. I am including a couple of links that describe the situation in Haiti today. I was saying to myself..the world has sent a trillion dollars to Haiti since the earthquake in 2010, why is she begging for money? There should be plenty of funding for her operation, running safe houses for children and family assistance. So..why doesn't she have money available to her? I was surprised to read that many countries that promised funds.. either didn't send the money, or sent it to relief organizations. If you read the last URL, it details how much money was received and how it was distributed. Just one of these, The Red Cross received 199 million, spent only 89 million.. what happened to the other 101 million not spent? And why can't Ms. Weinberg have some of it? It doesn't cost a damned thing.. zero, zilch, nada, nothing.. to be a decent human being. I have written every organization on this list requesting an update, and attaching a copy of this article. Perhaps it will generate some funding for her. If we don't want 10 million Haitians living in Whitehorse we'd better make sure they are safe, fed, have clean water, doctors, schools and a roof... in Haiti. Please let readers know where we can contribute to little footprints to allow this amazing woman continue her selfless acts. She is a credit to her family and someone all yukoners should be proud of. Brava! Wow. I held a gathering for a 100 shows for Haiti after meeting Greg Bennick. Edele Bonnaig was my guest speaker, Micheale Jean's cousin, who I just sent your story to. Si un jour Tu te trouves a Victoria, j'aimerais bien te rencontrer. I'd like to assist in some way but not sure how. Maybe allow a forum of brainstorming. Bon courage avec tes projets. Glad to know of such an amazing person like you. Wow you are a true inspiration and we are extremely lucky to have been blessed with having you as a member of our community. Thank you for all your hard work and sacrifice so that others might have a chance at life. You are amazing people and this story fills my heart with so much warmth and vigor. I am motivated beyond words to do more and will soon find ways to contribute to your cause. Thank you for being such a great role model and someone I can hold up as a beacon of light and hope!